KKI 6163 Wireless Vantage Pro2 with UV and Solar Radiation Sensors and 24-Hour Fan-Aspirated Radiation Shield is a must-have weather station for those climates that experience very warm temperatures! This upgraded Vantage Pro2 Plus model includes a fan-aspirated radiation shield that combines active and passive aspiration to minimize the effects of radiation. Solar-powered fans operate during the day and then shut down at night when the effects of radiation are less, keeping the sensors cool and accurate. The Vantage Pro2 Plus system includes a console unit and an innovative integrated sensor suite that includes a rain collector with self-emptying bucket, temperature and humidity sensors and an anemometer. The sensor suite is housed inside a radiation shield, protecting the sensors against solar radiation and additional sources of reflected and/or radiated heat. This high-tech Vantage Pro2 Plus model from Davis Instruments also adds two sensors not included with the regular Vantage Pro2, UV index and dose, solar radiation and evapotranspiration. These sensors are pre-installed on the sensor mounting shelf. The Vantage Pro2 Plus transmits and receives data from up to 1,000-feet away (line-of-sight) that's more than three football fields in length and a huge improvement over previous Vantage Pro models. The upgraded Vantage Pro2 Plus weather station retains all the features that made the original Vantage Pro so famous yet adds many more features such as button realignment to make navigating to often-used functions much easier; a redesigned rain collector that is laser-calibrated to ensure the best accuracy possible; and a re-tooled Integrated Sensor Suite with upgraded electronics. In addition, this quality Vantage Pro2 Plus weather station will track highs and lows (and/or totals and averages) for almost all weather variables for the past 24 days, months or years and track your local forecast! With the expanded transmission range that can be extended with optional repeaters, this wireless Vantage Pro2 Plus weather station includes an anemometer that can be mounted with the sensor suite or detached and placed in a separate location. The system includes 40-feet of anemometer cable to run back to the sensor suite for increased flexibility. 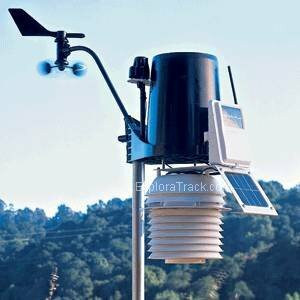 The wireless Vantage Pro2 Plus weather station includes a solar-powered sensor array and other features such as on-screen graphing, forecasting using easy-to-read icons (sunny, cloudy, rain, snow), barometric pressure trend, inside temperature, dew point, humidity information, time and date, and much more!